It’s a fantastic year for wildflower lovers, who’ve been frolicking amid fields of poppies, lupine and golden brush. The orange, purple and yellow blooms are already populating the warmer climes of southern California and the Central Valley thanks to above average winter rainfall following five years of drought. Hundreds of wildflower species blossom in California between March and July. The bloom is just beginning in coastal areas of Northern California, but some areas, like Lassen Volcanic National Park, won’t see snowmelt until June or July, so there are plenty more opportunities to catch upcoming wildflowers this summer. At KQED, we were curious about the size of the early spring Southern California blooms and whether or not you could see them from space. The answer: absolutely. The view from on high is spectacular. 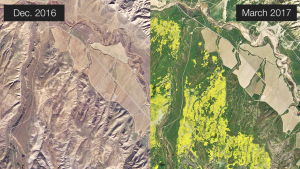 Using high resolution satellite imagery from Planet Labs—a start-up founded by three ex-NASA engineers—we can see vast carpets of wildflowers in Carrizo Plain National Monument, Bitter Creek National Wildlife Refuge and just north of Los Padres National Forest. Satellites captured the images in late March, at the height of the bloom, and in most of those places, the wildflowers are now gone. Lush green and yellow is replaced by reddish browns as the flowers opened up for just a few weeks to become pollinated before dying off. But you can still see vibrant colors in the satellite images on this page. Move the white scroll bar in the middle of each photo from left to right and to see a before and after comparison. And if you’re looking to see wildflowers in person, check out Visit California, which created a list of when different California regions will see peak blooms.